As a newbie to freezing, my first question was "What can I freeze?" I soon discovered that just about anything can go in the freezer. With our unlimited freezer space, we even freeze things which taste just as good canned ---- like tomatoes. On a 90 degree September day, when you've got a bushel or two of fresh tomatoes on your hands, you'll probably prefer cutting off the tops and throwing them whole into freezer bags rather than standing over a huge pot of boiling water at the stove for an hour. I know I do. I've run across only a few things which I wish I hadn't put in the freezer. The biggest one is peaches. Last summer, I bought a couple of bushel baskets of peaches and cut them all up, dreaming of tasting summer peaches on a cold winter day. But when I thawed them back out, I discovered that the fruit chunks had turned flabby and brown and lost a lot of their delicious flavor. This year, I plan to can or dry my peaches. Two years ago, I made a similar mistake with freezing basil and parsley by themselves. The thawed out herbs were woody and flavorless, but luckily I froze lots of pesto which preserved the fresh basil taste much better. If you're going to freeze herbs, try freezing them in oil, or just make up some spaghetti and pizza sauces in advance and freeze those. What kind of containers do you use for freezing? RE: Peaches - Try soaking them for a few minutes in a solution of water and citric acid (either the powder or lemon/lime juice) before freezing them. I do this when drying fruit to keep it from going all brown and yucky. Not sure if it will work with freezing but it's worth a try! Fostermamas --- I use plastic containers that Mark's mom gets at a restaurant supply store. I like them because they're stackable, take up very little space when empty, and come in three sizes (cup, pint, and quart) all of which use the same lid. They are a bit fragile when frozen, but losing a few every year isn't a big deal since they're really cheap. Everett --- intriguing idea for the peaches. I may have to try that! Wow, I've never tried freezing whole tomatoes! Pretty cool! As for peaches, I add sugar to peeled, cut up peach chunks, let them macerate a few minutes, and then freeze. I use them in baked goods and ice creams. I should add, on the tomato front, that you should only freeze them whole if you don't mind eating the seeds and skins. We like it all, except the woodiest bit o the core, which I cut out. If you're a no-skin and no-seeds person, you'll want to remove those before freezing most likely. Interesting technique with your peaches. Do you ever eat them raw when you thaw them? How do they taste? Hi, ran across your site while looking at automatic chicken coop door openers! I have a suggestion for the freezing of herbs. I bought a few extra plastic ice cube trays at Goodwill for this. I cut the herbs over the trays and fill up the areas without there being too much bulging over the top of the little cubicles. I then put in just a little water to cover each cube. I freeze them and then dump the cubes into freezer bags and label. I can then pull out a cube and throw it into whatever I am cooking. If I need to have some thawed for salad dressing seasoning or whatever, I just place the cube into a very small mesh strainer and let it thaw, or run water over it. I have done this successfully with varieties of parsley, chives, and basil. I even blend up some mixtures with cucumber, dill, etc... in the blender and freeze that in the trays for mixing into dips etc...I also have learned I can peel any extra garlic, put the cloves into a small, wide mouth freezer jar, cover with vegetable oil, cover with a regular canning lid and freeze my garlic cloves. I always have a jar in the door of the freezer in case I run out of fresh. As long as your garlic stays covered with the oil it keeps a very long time. Great idea on the freezing herbs in water front --- I may have to try that! 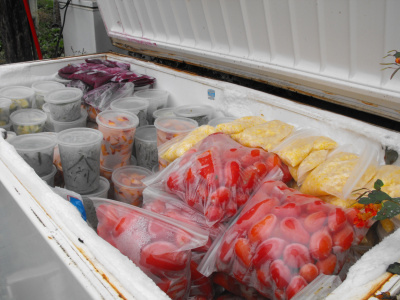 Very good information on freezing produce. I am really enjoying the site. Garlic stored in oil is a huge botulism risk so never do that. I wouldn't even risk it in the freezer. Someone else mentioned the danger of garlic in oil leading to botulism on another post, but to the best of my knowledge, botulism is not a problem in the freezer. That's one of the big reasons so many people freeze food instead of can it --- it's a lot safer and harder to go wrong.